Today, October, 28, marks the first anniversary of the death of Hasan Niyazi, a young art history buff and blogger from Australia. Before his very untimely death at about the same age as his idol Raphael, Hasan's blog, "Three Pipe Problem," had developed into one of the most popular art history blogs receiving more than 10000 page views each month. In remembrance of Hasan I would like to reproduce below one of the guest posts that he kindly allowed me to put on his site. The painting reminded me of Giorgione’s “Laura” where a young woman in a state of undress is partially covered with a man’s robe. Scholars of Venetian art have noted that both the disheveled look and the man’s robe indicate a courtesan. 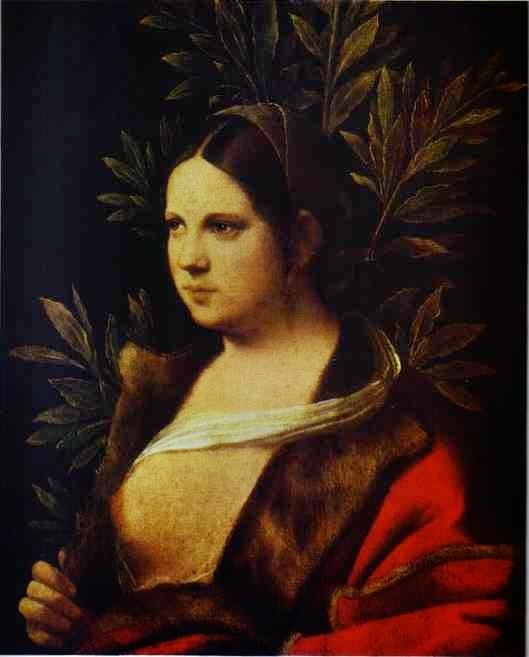 In “Giorgione, Myth and Enigma”, the catalog of the 2004 Giorgione exhibition, the entry for Giorgione’s “Portrait of a Young Woman” (Laura) noted the following. 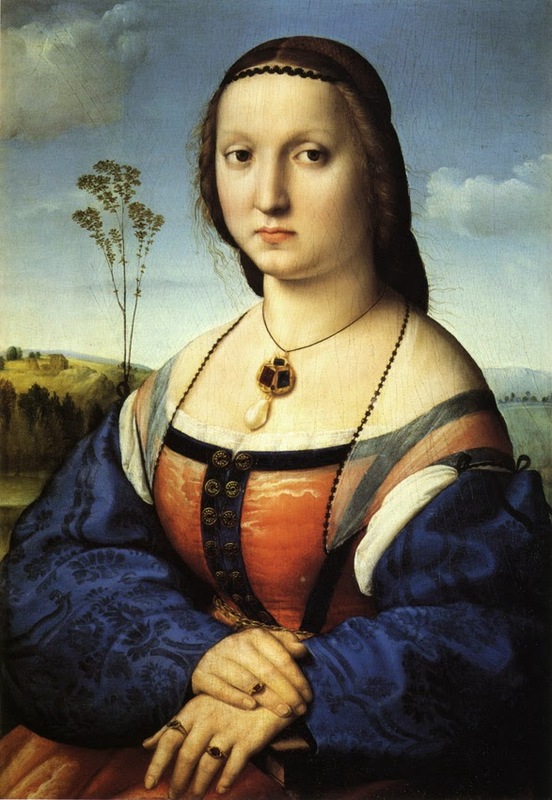 My first impression led me to take a look through other Raphael portraits of men and women. 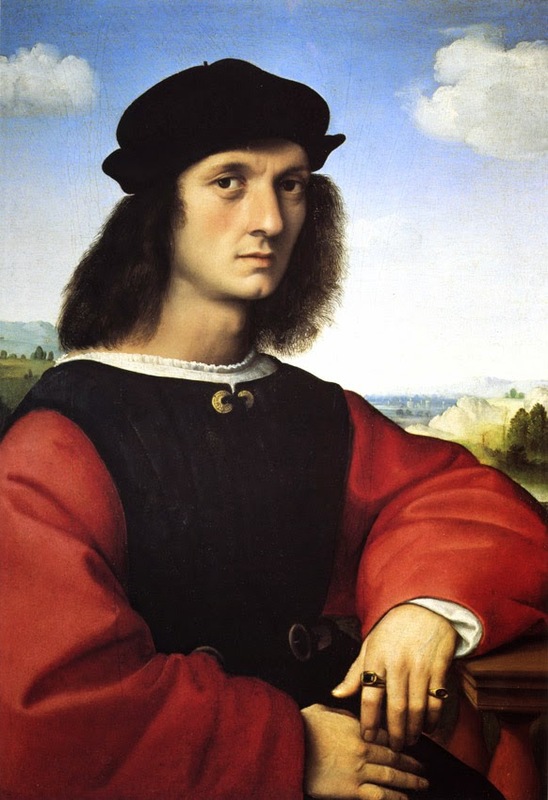 Even a cursory look at a Raphael catalog indicates that the hair of a Raphael man is rarely in such a long and stringy, even unkempt, fashion. Moreover, with one exception he never parts their hair in the middle or even exposes their foreheads. Men’s foreheads are usually covered with a cap that sits firmly on top of the head and not worn at the same rakish angle as in the lost painting. 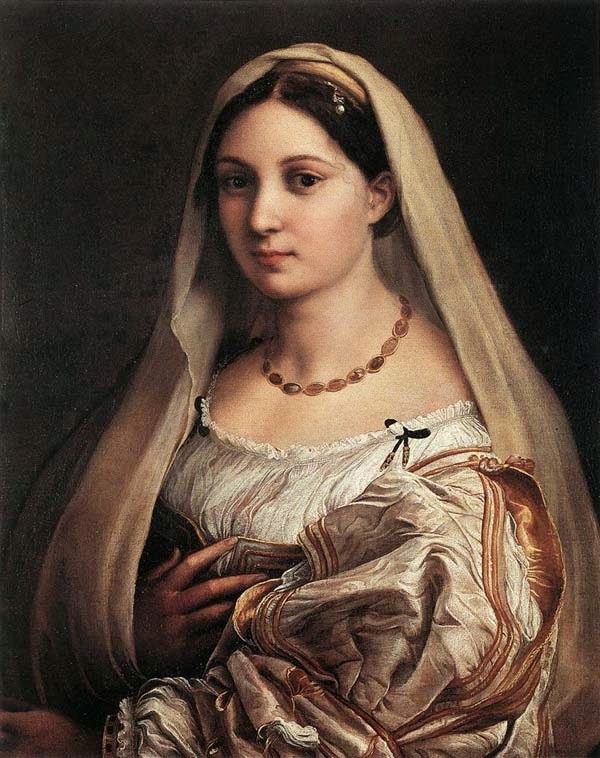 Raphael’s women, even Madonnas, inevitably have their foreheads exposed with hair neatly parted in the middle. The portraits of Agnolo and Maddalena Doni provide a striking example of hair fashion around 1505-6. The man’s forehead is covered with his cap firmly on top of his head. The woman’s long hair is parted neatly in the middle and her hair is covered with a diaphanous veil. Things are much the same ten years later if we compare the portrait of Baldassare Castiglione with “La Donna Velata”. Castiglione’s cap is firmly atop his head and completely covers his forehead. The donna’s forehead is uncovered with long hair parted neatly in the middle. The back of her head is covered with a long white veil. Even the famous “La Fornarina" has hair neatly parted in the middle but with her hair tied back with a scarf. Only in the “Double Portrait with a Fencing Master” is a man’s forehead exposed but in that case the hair is neatly trimmed and the man has considerable facial hair. Hasan Niyazi’s post on “Three Pipe Problem” also provided some inadvertent information that supports a “young woman” reading. Two early engravings taken from the painting or copies emphasized female characteristics especially the exaggerated curl of the lips. Also, Three Pipe Problem presented a striking detail from the School of Athens that would seem to indicate a juxtaposition of Raphael and his lover, the only two figures in the famous fresco looking out at the viewer. No one has ever accused Raphael of being a homosexual. My first impression led me to get a copy of Oskar Fischel’s two-volume study of Raphael, a work that represented the culmination of a lifetime devoted to the rehabilitation of Raphael. Like the Czartoryski painting Fischel was also a casualty of the Nazis. He was born in 1870 and the book jacket describes him in this fashion. Fischel devoted only half a page to the Czartoryski painting discussing it right after the more famous “La Donna Velata.” To put it in context here are a few of his words on that woman that lead him into a discussion of the Czartoryski. The following discussion of the so-called "Vision of Ezekiel" originally appeared as a guest post on Hasan Niyazi's popular Art history blog, "Three Pipe Problem." This month marks the first anniversary of Hasan's untimely death last year at about the same age as his beloved Raphael. Since Hasan's site is not currently open, I am publishing some of my guest posts here. This post illustrates how Hasan and I worked together using our different skills and approaches. In a 2011 post Hasan had discussed the controversy raging in Italy over the authenticity of a Raphael painting known as the “Vision of Ezekiel” now in the Pitti Palace in Florence. 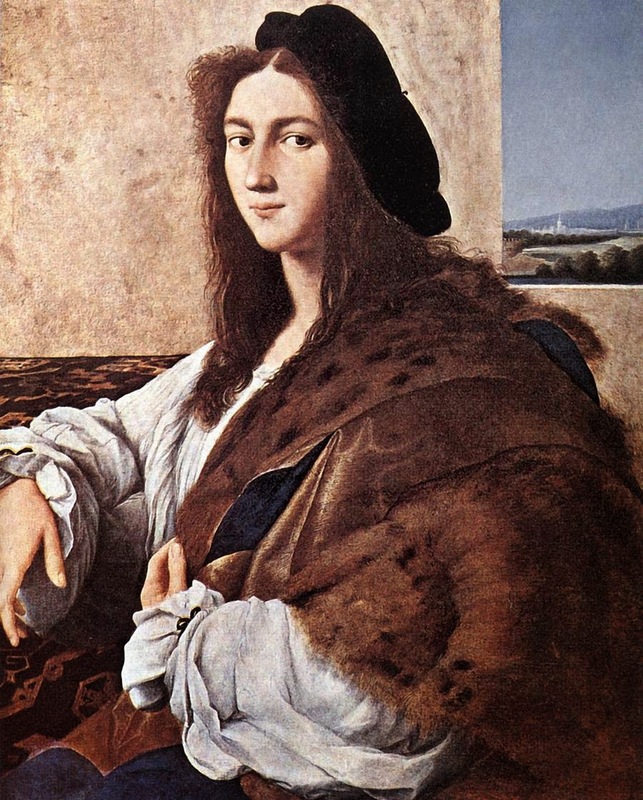 The question of whether this painting was by Raphael or one of his associates had little interest for me, but as I read on another question came to mind. It would appear that the subject of the painting has been misunderstood ever since Giorgio Vasari mentioned it in his biography of Raphael. 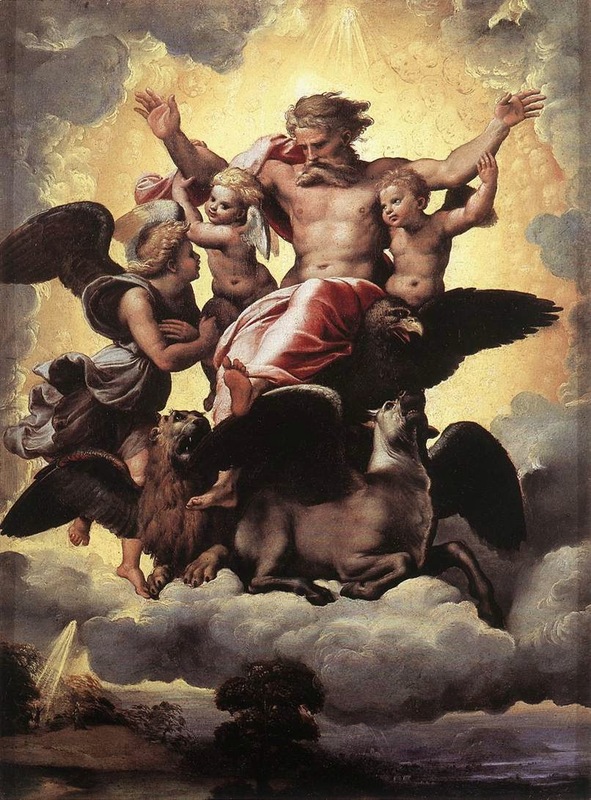 Vasari said that the subject of the painting is “Christ enthroned amid the clouds.” He did mention that Christ was surrounded by the four animals that Ezekiel saw in his vision. Even though the painting called to Vasari’s mind the vision of Ezekiel, the artist, whoever he was, must certainly have had a different vision in mind. The vision in this painting is the vision of St. John from the Book of Revelation (Apocalypse). Let’s just compare the two visions. Here is the account from the book of the Prophet Ezekiel. Between these animals something could be seen like flaming brands or torches, darting between the animals; the fire flashed light, and lightning streaked from the fire. And the creatures ran to and fro like thunderbolts.” Ezekiel 1: 13-14. The animals are in Ezekiel’s vision but there is no God or Christ enthroned among them. Ezekiel’s vision found its way into the Book of Revelation, a book replete with imagery from the Hebrew Scriptures. Here is St. John’s vision (Jerusalem Bible). My name is John…I was on the island of Patmos for having preached God’s word and witnessed for Jesus; it was the Lord’s day and the Spirit possessed me, and I heard a voice behind me, shouting like a trumpet, “Write down all that you see in a book…Revelation 1: 9-13. Then, in my vision, I saw a door open in heaven and heard the same voice speaking to me, the voice like a trumpet, saying, “Come up here: I will show you what is to come in the future.” With that, the Spirit possessed me and I saw a throne standing in heaven, and the One who was sitting on the throne, and the Person sitting there looked like a diamond and a ruby….In the center, grouped around the throne itself, were four animals with many eyes, in front and behind. The first animal was like a lion, the second like a bull, the third animal had a human face, and the fourth animal was like a flying eagle. Each of the four animals had six wings and had eyes all the way around as well as inside;…Revelation 4: 1-8. In John’s vision God the Creator, “the One” sitting on the throne in the midst of the four creatures, is the most prominent figure. Vasari identified the figure as Christ but the figure more closely resembles Michelangelo’s images of God the Father in the Sistine chapel. Only later in John’s account would the Lamb join the One sitting on the throne. 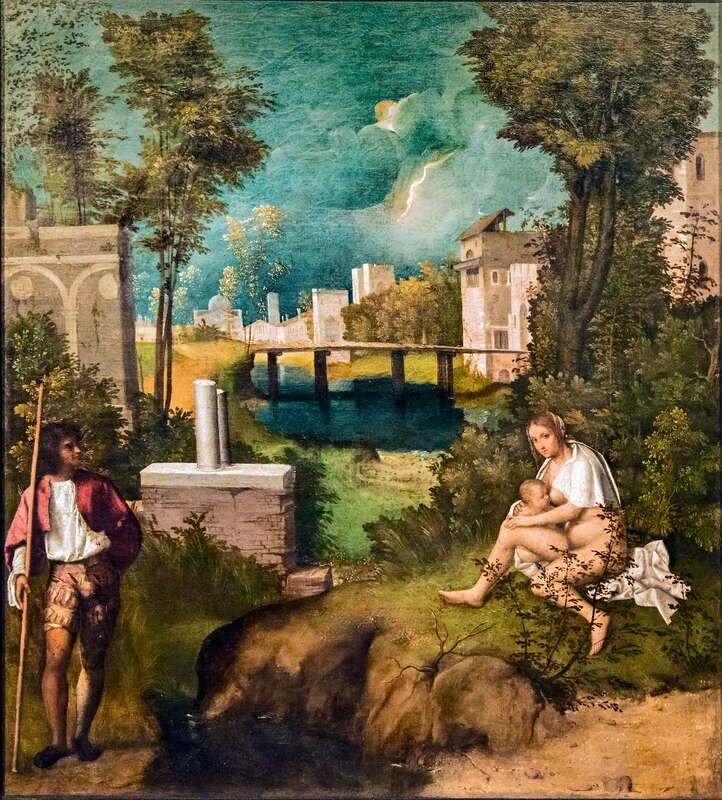 In the “Vision of Ezekiel” the small figure on the left receiving the vision must then be identified not as Ezekiel but John, exiled on the isle of Patmos. It is hard to tell, but he seems to be on an island facing a broad expanse of sea rather than in a crowd of people at the bank of the river Chebar. Some scholars have argued that there is a companion piece to the “Vision of Ezekiel” that did not find its way back to Italy after the fall of Napoleon. In his study of Raphael Jean-Pierre Cuzin discussed a small oil on panel of the Holy Family. The small Holy Family is also a misnomer. It is actually a depiction of the encounter of Mary and the infant Jesus on their return from the flight into Egypt with her cousin Elizabeth and the infant John the Baptist. With or without St. Joseph this legendary meeting was a very popular subject since it marked the initial acceptance of the mission of Christ. Usually the Christ child accepts the small cross from the young Baptist but in this case he accepts the Baptist himself. *Giorgio Vasari, Lives of the Most Eminent Painters, selected, edited and introduced by Marilyn Aronberg Lavin, Volume II, New York, 1967. p. 41. **Jean-Pierre Cuzin: Raphael, His Life and Works, New Jersey, 1985. p. 226.